When the subject of crab dip came up at our house (still staying with the folks for awhile) my step-mom, yes, the one who makes the Wayside Inn Carrot Cake, oh, that carrot cake, pulled out her recipes, leafed through the binder and pointed out this hot, little number. Aunt Lou’s Hot Crab Dip. Ya gotta love, that doncha? Aunt Lou was said to have been quite a cook, and we loved this dip: warm, creamy with just a bit of a horseradish bite. It was perfect on these cute little Nut Thins. Of course any cracker will do, here. Since I talked a bit about crab, cream cheese and pricing on my last post (this is like the tale of two crab dips) I’ll forgo that, here. Click over if you’d like to see my Mom’s Old-Fashioned Crab Dip. It’s interesting to see how similar the recipes are in ingredients, yet so different in taste. Either (or both) would be perfect for a holiday spread. I wouldn’t sweat the amount of crab meat in a recipe like this; just get as close as you can. We used a can, being in South Dakota, which I think came to about 4 ounces and it was still excellent. 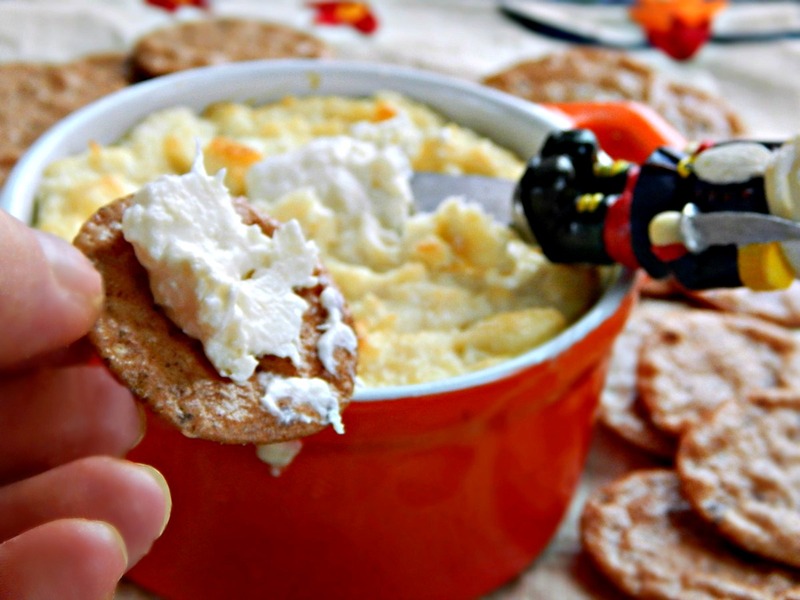 Aunt Lou’s Hot Crab Dip – I would be grinning, too, if I were dropped in a vat of this! Mix together all ingredients except crab. Fold in crab gently. Put in small baking dish and bake, uncovered, 35 – 45 minutes, until lightly browned and bubbly. May be heated through and placed in a chafing dish, instead. I’ll be sharing this recipe on a couple of link parties! What’s a link party, you say? A Virtual Party where bloggers share a small photo of their best posts of the week and a link you can click on – it’s a great way to see a bunch of blogs if you’re a viewer and to be seen if you’re a blogger! This week, I’ll share to Fiesta Friday 99, put on by Angie of the Novice Gardener and co-hosted by Caroline @ Caroline’s Cooking and Linda @ La Petite Paniere. I’ll also be sharing to Thowback Thursday #18, co-hosted by Moi!! Yes, that’s me, yours truly! And Alli, Quinn & Meaghan – you’ll see all their links on Throwback Thursday! So stop by and see what all the fun is about!! Visit, mingle, comment and share! It’s a party, after all! This entry was posted in Click here for Fabulous Food Posts and tagged Appetizer, crab, Easy Recipe, Fish and Seafood, Frugal Hausfrau, Spreads and Dips. Bookmark the permalink. I love crab, and this dip looks amazing. Pinning! I wonder if that’s where Aunt Lou got it? I’m not at home or I’d be pulling out one of my Joy’s now! Merry Christmas! Sounds delicious – I think I’ve only had a hot crab dip once but this sounds worth having again! Thanks for sharing at Fiesta Friday. Well, it’s so easy and so good, and it’s fun to have during the holidays! Love crab dip. Yours sounds delicious! Thanks for sharing. Thanks Suchitra – we love it and went through ours pretty fast! Oh! I love crabs a lot! And I don’t mind eating this dip just like an ice cream. Not in an ice cream cone, of course! 😀 This looks so delish! I knew exactly what you meant! 🙂 Thanks, Jhuls! This sounds amazing! Maybe I’ll have to make it as a New Year’s Eve snack. Hi Carlee, it’s a great New Year’s Eve item! Simple enough, but nothing says New Years like a little seafood! Thanks! I fell in love with them. From Pier 1. I was afraid it would overpower things but it really was nice in this. Far more subtle than I had first assumed.